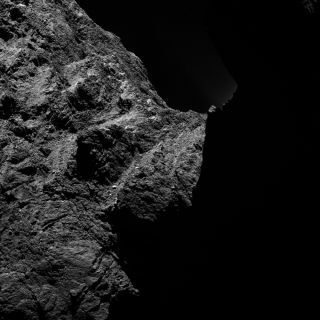 This image shows the "dark side" of Comet 67P/Churyumov-Gerasimenko as seen by an instrument aboard the Rosetta spacecraft. A European spacecraft is a big step closer to attempting history's first-ever soft landing on a comet tomorrow. The European Space Agency's (ESA) Rosetta probe, which is currently orbiting Comet 67P/Churyumov-Gerasimenko in deep space, has been given the "all clear" to continue on with its bold maneuvers that scientists hope will allow the craft's Philae lander to safely touch down on the comet's surface. If successful, the landing Wednesday (Nov. 12) will mark the first time humans have ever landed a spacecraft on a comet. "If everything is going according to plan, and we certainly hope it will, fingers crossed, then tomorrow, late afternoon, Rosetta will make history," ESA's Monika Jones said during a webcast today (Nov. 11). We're already one step closer to that because, a short while ago, we passed the first hurdle — we got the first 'go,' the first 'go ahead' with the landing sequence." You can watch ESA's webcast of Rosetta events all night and into Wednesday, live on Space.com. The two spacecraft are expected to separate at about 3:35 a.m. EST (0835 GMT) on Nov. 12, when they will be flying about 14 miles (22.5 kilometers) from the comet's center. Scientists on the ground should get confirmation of Philae's separation a little less than 30 minutes after it happens in space. ESA operators are expected to go through a series of three more "go/no go" calls throughout the night before separation. The second go/no go should happen at about 7 p.m. EST (0000 GMT) tonight and will confirm that Rosetta is in good health and that the Philae deployment instructions are ready, according to ESA. The third call will happen more than an hour after the second go/no go and will involve a final check of Philae's systems, and the fourth go/no go will be the final decision on whether to separate the lander from Rosetta. Rosetta and Philae arrived at Comet 67P/C-G in August, and since then, Rosetta has been gathering data about the strangely shaped comet. Once Philae lands, it will start photographing and studying samples of the comet as Rosetta continues to look at it from orbit. Scientists are using the Rosetta mission to learn more about comets — leftover chunks of ice and dirt from the dawn of the solar system 4.6 billion years ago. Philae will have the ability to drill into the comet's surface, potentially revealing some new insights in the process. The unprecedented research could even help scientists learn more about the origins of Earth's water. "Comet impacts are thought to have been one of the principal means by which water was delivered to the early Earth, around 3.6 billion years ago, possibly contributing half the water in our oceans," planetary scientist Stanley Cowley, of the University of Leicester in England, said in a statement. "The other half would have come from the Earth’s interior," he added. "Furthermore, the comet material is also known to contain simple organic molecules, which may also have seeded Earth with the material from which life emerged. So, [there are] lots of good reasons to look at these objects carefully!"